Exactly a year ago we launched our first mobile websites at Edge Hill using a plugin for WordPress to provide a mobile friendly theme for our blogs. Yesterday we committed the first code for a mobile version of the main Edge Hill website. It’s been a long time coming with a lot of talk followed by research and attending conferences but we’re finally on our way. Universities all over the UK and abroad are waking up to growing mobile usage and an expectation that we will provide services on multiple platforms. And there are almost as many approaches to take as there are universities from dedicated mobile applications for each platform to open source libraries. Each HEI must decide who their target audience is, what they want from mobile services and the best way to deliver that information. For us, with limited resources, that means making choices about where to start and prioritise. At Edge Hill we have for a long time had quite a clear split between internal and external content. The corporate website – www.edgehill.ac.uk – is the place for public information about the University: courses, history, departments, news, events etc. GO on the other hand is clearly inward facing. It targets staff and students with personalised information of interest to them. Access to web based university systems is provided through it most of the time you only have to log in once per session to get to everything. This provides a nice divide that can apply to what we do for mobile devices. Initially we will be working on a mobile version of the corporate website with internal systems following later. So what does that mean? For me there a number of things that we need to address. Let’s address each of those in turn. With the new iPhone 4 having a resolution of 960 × 640 pixels it’s no longer fair to say they are low resolution – that’s higher than a printed page! But there’s no escaping that mobile devices have small screens. This means that normal web pages must be zoomed out to unreadable levels to display fully. Additionally, older devices have poor quality web browsers unable to properly render the complex HTML we use on our websites and making the site look even worse. For mobile devices we will be redirecting requests to a separate version of each page rendered with a different template. Pages will be stripped down and designed for maximum readability. Exactly how pages look will depend on the phone (and the web browser). I can’t give an exact list of devices that we’ll be testing against and aiming to support but it we will initially be focusing efforts on higher-end phones for example, iPhones, Android and Palm Pre. Aside: there are two main factors that promote the use of mobile websites – devices and data. Modern phones make browsing mobile websites much easier, they often have applications for direct access to services like Facebook or Twitter further promoting use on the move but without data this is impossible. Unless a user has free or very cheap data they will be disinclined to make use of services. Therefore we can get maximum return on investment by targeting services at those users with both devices capable of accessing our site and the data package that allows them to do so. I was struggling to come up with a good title for this point, can you tell? Essentially it breaks down into two things: place and position. Place is where you are when accessing a mobile website, for example you’ve got off the train at Ormskirk railway station and need to know how to get to campus. Position reflects common use of mobile devices while sat on a couch or on the bus in lieu of a normal computer. Both these affect the type of information you offer and may require changes to be made to existing content. Tying together these two things is the site structure. Having pretty looking mobile pages is no use if you need to navigate through several pages to get to the information you want. What might be a feature on the homepage of the desktop website may be unimportant for most people accessing from a mobile device. The aim here isn’t to make some content inaccessible, merely to highlight key areas and make it easy for users to find that information. So this is week one and it’s still early days. Because the mobile website will sit alongside the existing site it’s likely we will preview alpha and beta versions ahead of a full launch. We obviously cannot afford to buy every possible device so we’re looking to recruit testers that we can get feedback from so if you have a mobile phone with free or cheap data that you don’t mind using to try out our mobile sites, let me know in the comments or by email. Stay tuned for more about the progress of this project over the summer – there should be lots of juicy technical detail of our design and development process! 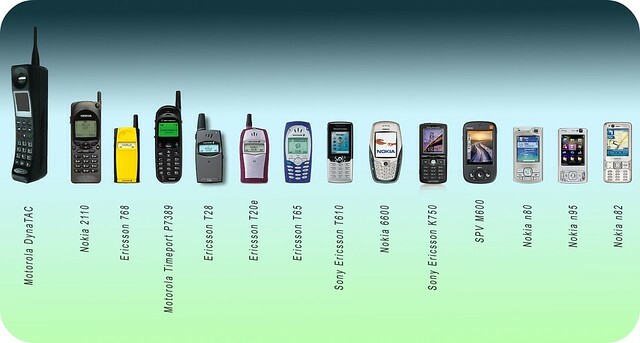 A mobile phone timeline by Khedara. Are you sure that 960 x 640 is higher resolution than a printed page? Typically, images are printed at at least 300dpi, giving 2480 x 3500 for an A4 sheet, and text or vectors at 1200dpi. The iPhone 4 has a resolution of 326 pixels per inch. Granted modern laser printers can print at silly high resolutions but 300 dpi isn’t far off the resolving power of the human eye.